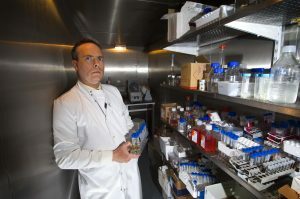 The scientists, members of the University’s Stress, Ageing and Disease Centre of Research and Enterprise Excellence, worked together to select the best compounds for testing from a library designed and synthesised by Dr Vishal Birar, whilst he was undertaking a University of Brighton-funded PhD studentship under Dr Ostler’s supervision. 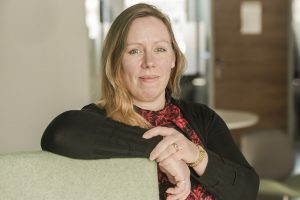 The scientists were part of a team led by Professor Lorna Harries, Professor of Molecular Genetics at the University of Exeter. This discovery, funded by the Dunhill Medical Trust, builds on earlier findings from the Exeter group that showed that a class of genes called splicing factors are progressively switched off as we age. Researchers found that splicing factors can be switched back on with chemicals, making senescent cells not only look physically younger, but start to behave more like young cells and start dividing. The researchers applied the selected resveralogues, chemicals based on resveratrol which is a natural compound found in red wine, dark chocolate, red grapes and blueberries, to cells in culture. The chemicals caused splicing factors, which are progressively switched off as we age to be switched back on. Within hours, the cells looked younger and started to rejuvenate, behaving like young cells and dividing.